The gardens of the Generalife. The Alhambra Palace in Granada, Spain. me miro y me peino el pelo". We retake our tale of the Alhambra after the visit to the Palace of the Lions; it was already high noon, which in Spain is the sacred time for Siesta, when businesses close and people retreat to neighborhood cafes to while away the afternoon. After leaving the Nasrid palace complex we walked down the Calle Real (the royal street) towards the Medina, and we came upon the gates of the old convent of San Francisco. The convent was built on the remains of the Alhambra's mosque and is now a hotel with a Michelin rated restaurant. Gardens of the Infante and the Generalife in the distance. The Alhambra. Granada, Spain. We settled for lunch under the canopy of the orange trees that line the convent's terrace, and from there we enjoyed the view of the gardens of the Infante and the Generalife Palace. After lunch we spent the rest of Siesta wandering through the gardens of the Partal Palace. "Torre de las Damas" (Tower of the Ladies) in the Partal Palace, the Alhambra. Granada, Spain. The Partal, which in Arabic means portico, was built by Mohammed III in the 14th century. The structure has suffered many modifications through the centuries, and though only a small portion of the original complex remains, the refinement and delicacy of its ornamentation make the Partal a prime example of Nasrid architecture. 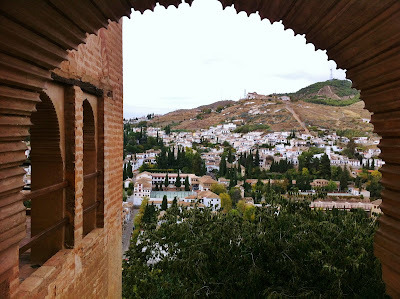 A view of the Alabicín from the Partal, the Alhambra. Granada, Spain. The Partal Palace, the Alhambra. Granada, Spain. Gardens of the Partal, the Alhambra. Granada, Spain. The ramparts of the Alhambra seen from the Hill of the Sun. Granada, Spain. The Generalife was created as a retreat villa for the Sultan and his family. In Nasrid times the residence, which crowns "El Cerro del Sol" (the Hill of the Sun), was surrounded by gardens and orchards which were conceived by its original builders as an approximation of Paradise. The entrance court to the villa, the Generalife. Granada, Spain. Patio de la Acequia, the Generalife. Granada, Spain. Despite the many alterations made to the villa, the Patio de la Acequia is the best preserved precinct of the Generalife complex; here light and shadow alternate to provide warmth and cool. El Patio de la Acequia, the Generalife. Granada, Spain. The courts of the Generalife are exemplar of the Iberian/Muslim garden, in which the garden is separated from the orchards by pavilions and porticoes, and the courts are furnished with a pool, lined with evergreen trees and flowers laid out in geometric arrangements. El Patio del Ciprés (the court of the cypress), the Generalife. Granada, Spain. The Water Stair, garden of the Generalife. Granada, Spain. The sun was setting now, we left our high perch on the garden terrace and slowly descended the Hill of the Sun towards the Puerta de las Granadas and the Albaicín beyond. Night fell over Granada and her Alhambra. The roof of the Generalife. Granada, Spain. La Puerta de las Granadas (The gate of the Pomegranates), the Alhambra. Granada, Spain.